Summary: Extra Heavy-Duty Cutter with an anti-slip rubber grip. 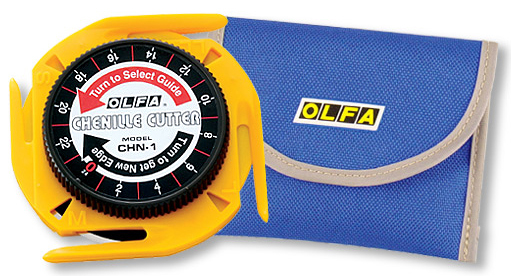 Summary: OLFA X design ComfortGrip series - extra heavy duty cutter. Sure grip handle made of elastomer for Acid and Aceton (oil) resistant. Summary: 2-Way Heavy-Duty Cutter with blade reapplication system. Summary: Extra length Heavy-Duty Cutter for jobs requiring extra "reach". Equipped with an anti-slip rubber. Suggested Uses : Cutting gaskets out of windshield, industrial applications, etc. 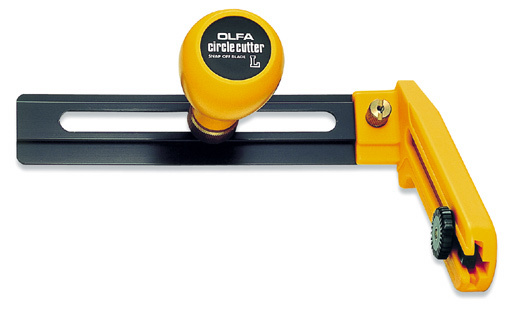 Summary: Heavy-Duty Circle Cutter designed to cut thick cardboard and plywood from 7cm to 30cm diameter. Suggested Uses : Excellent for cutting materials ranging from cardboard, paper and acetates to heavy rubber gasket material. Summary: OLFA X design ComfortGrip series - Heavy duty cutter Sure grip handle made of elastomer for Acid and Aceton (oil) resistant. Built-in hard metal pick for multi-purpose applications. Suggested Uses : DIY projects, construction, industrial applications, etc. Summary: The most popular standard cutter. Metal handle. A pocket clip/blade snapper is included. Suggested Uses : General cutting, paper, plastic film, shrink-wrap, etc..
Summary: Secure screw locking blade for demanding cutting work. Suggested Uses : Cutting through wallpaper, plastc films, art & craft , scrapbooking applications, etc. Summary: With 30 degree angled blade for graphic arts. Includes a pocket clip/blade snapper. Suggested Uses : Cutting through wallpaper, art & craft, scrapbooking applications, etc. Summary: The 45mm most popular rotary cutter. Accommodates both right- and left-handed users. Suggested Uses : Perfect for general quilting, sewing and craft projects. Summary: Hobby rotary cutter with an 18mm stainless steel rotary blade. Accommodates both right- and left-handed users. Suggested Uses : Perfect for curved piece quilting, applique, trimming seams, template cutting, scrapbooking and miniature quilting. Summary: Wave cutter with a stainless steel blade designed to create wavy edge on the fabric. Removable blade cover included. Suggested Uses : Creating decorative edges on craft and hobby . Summary: Heavy-Duty Saw Cutter with an anti-slip rubber grip. Comes with 2 free LB blades. Suggested Uses : DIY project, construction, industrial,art & craft. Summary: This heavy-duty plastic/laminate cutter is designed to produce a very fine score line in order to precisely break plastics, acrylic and laminates. Features 2 spare blades in the handle. Summary: Standard-duty plastic/laminate cutter is designed to produces a very fine score line in order to precisely break plastics, acrylic and laminates. Features 2 spare blades in the handle. Summary: Equipped with a 45mm rotary blade for cutting linoleum, carpet, etc. Suggested Uses : Perfect for cutting linoleum, carpet, shrink wrap and nylon straps. Summary: Two handed use for tough cutting jobs. Extra long handle provides space for replacement blade storage. Five blades stored in the handle. Summary: Uniquely designed revolutionary chenille cutter. Features: 4 channel guide sizes from narrow to wide width. 24 new blade edges. Cuts curved and straight lines. Accommodates both right- and left-handed users. A cute carrying case convenient for carrying and storing the cutter is included. Suggested Uses : Use to make your own chenille quilt, cut multiple layers of fabric, felt fleece and more. Summary: Anti-Slip rubber grip, multi purpose model. Includes a pocket clip/blade snapper. Suggested Uses : Cutting through wallpaper, plastic films, art & craft applications, etc. Summary: Quick Blade Replacement 60mm rotary cutter. A single click is all it takes for perfect blade replacement. A split blade cover to minimize blade exposure while cutting. Ergonomically designed ComfortGrip. Both right and left handed uses just by switching hands. No assembly required. Summary: The biggest deluxe 60mm rotary cutter. 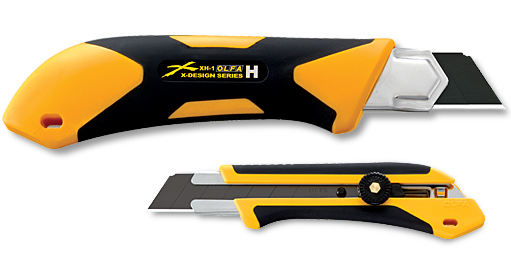 Ergonomic design for powerful cutting and less hand fatigue. Features a dual-action safety mechanism. Accommodates both right- and left-handed users. Suggested Uses : Multi-layer fabric cutting as well as sewing, quilting and craft projects. Summary: Perforation cutter with an 28mm blade. Because of bigger (28mm) diameter, deeper serated edged alloy tool steel blade, the PRC-3 will be most welcomed for frequent users of perforated cutting. Summary: Heavy duty hook cutter, carbon tool steel blade. Suggested Uses : Perfect for cutting shrink wrap and nylon straps. Summary: Carton cutter with an adjustable depth gauge and a built-in staple remover. Suggested Uses : Cutting cardboard, plaster board, foam board, gator board, etc. Summary: Deluxe 45mm safety rotary cutter. The ergonomic design provides reducesd fatigue. Features a dual-action safety mechanism. Accommodates both right- and left-handed users. Summary: The XA-1 grip is made of glass fiber-reinforced Polypropylene conjoined with Elastomer, and is superior to ABS handle in its Anti-Aceton, Anti-Acid, and Anti-shock properties. The physical feature of the XA-1 make it practical for construction and painting jobs. Well-known and established auto lock model with an ultra sharp black blade. Summary: The 60mm largest rotary cutter is especially useful for cutting multiple layers of fabric. Accommodates both right- and left-handed users. Summary: The 28mm small rotary cutter. Accommodates both right- and left-handed users. Suggested Uses : Perfect for general quilting, sewing and craft projects. This cutter is great for small-scale projects, miniatures and tight corner. Summary: Deluxe 28mm safety rotary cutter. The ergonomic design providing a comfortable and secure grip even for small handed users. Suggested Uses : Small scale projects, miniatures, and tight corners. Sewing, quilting and craft projects. Summary: Pinking cutter with a stainless steel blade designed to create a pinking edge that prevents the fabric from unraveling. Removable blade cover included. Summary: Quick Blade Replacement 45mm rotary cutter. A single click is all it takes for perfect blade replacement. A split blade cover to minimize blade exposure while cutting. Ergonomically designed ComfortGrip. Both right and left handed uses just by switching hands. No assembly required. Summary: Rotary compass cutter with an 18mm stainless steel rotary blade. Perfect for cutting fabric circles in diameter from 4cm to 22cm. Unique ratchet handle is simple and easy to use and greatly reduces wrist fatigue. Designed for both right- and left-handed use. Suggested Uses : Perfect for making circles in fabric for quiltmaking, applique, etc. Summary: Heavy-duty cutter with adjustable cutting guide and adjustable depth gauge, built-in staple remover. Summary: Graphic knife with multiple blade reapplication system. Summary: 2 in 1 tool, Cutter & Saw. 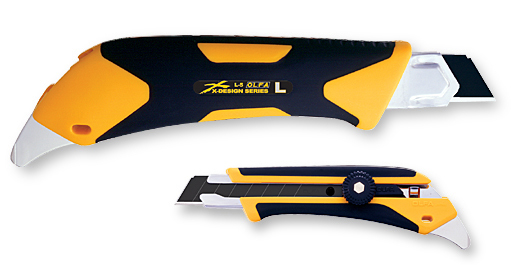 Contains a snap-off LB blade and a saw blade.